With the HubSpot Sales Chrome extension installed, you'll see a HubSpot sprocket icon in the upper-right corner of your Gmail account. This is where you configure your extension settings. 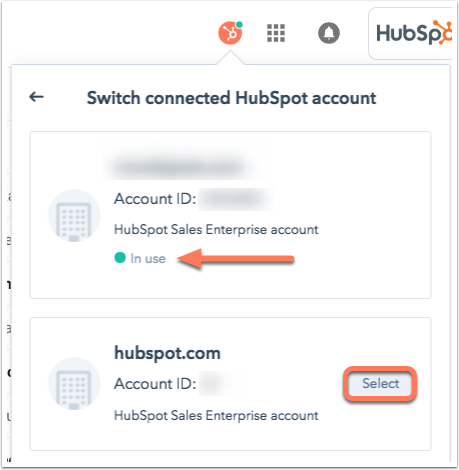 Click Switch connected HubSpot account to choose a different HubSpot account to store your email tracking and logging information (if you have multiple HubSpot accounts). 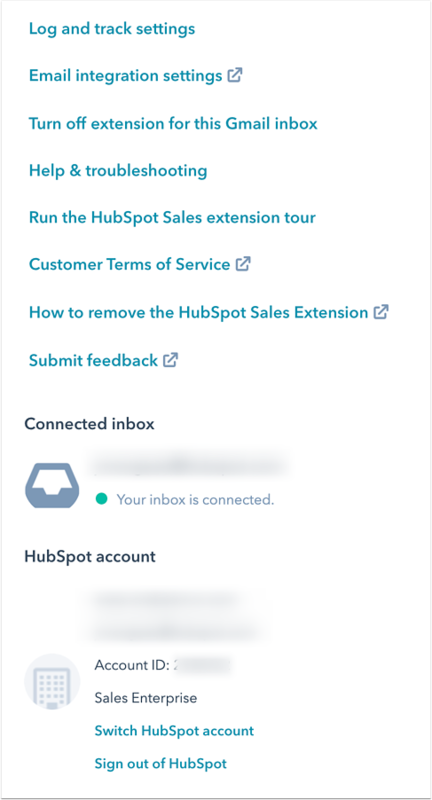 Once you click this option, you'll see the HubSpot account you're currently connected to marked as In use. You'll also see a list of your other HubSpot accounts. 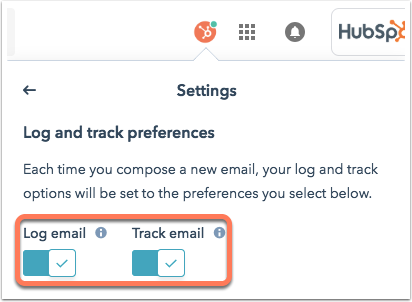 To select a different HubSpot account to sync with your tracked and logged emails (and to use sales tools from), click Select next to that account. In the dialog box, review the information on how this configuration option will affect your data. Click Continue, then click Got it to complete the process. You can also change your connected account in HubSpot. Click Log and track settings. On the Never log screen, in the text field, enter an email address or a domain you do not wish to log emails for and click Add. You can continue to add additional email addresses or email domains to the field one at a time, clicking Add after each addition. When you send an email to a recipient with the email address or email domain that's on your Never log list, the email will not log in HubSpot. You can also specify never log emails and domains from your HubSpot account settings. Click the Manage dropdown menu beside the email address or email domain, then select Remove. Team admins will also have the option to Block for all users. That way, other users in the account will not be able to log emails to the specified email address or email domain. You can also block specific IP addresses from email tracking in HubSpot. With a connected inbox, you can set log and track defaults under your extension settings. Click the sprocket icon sprocket, then select Log and track settings. 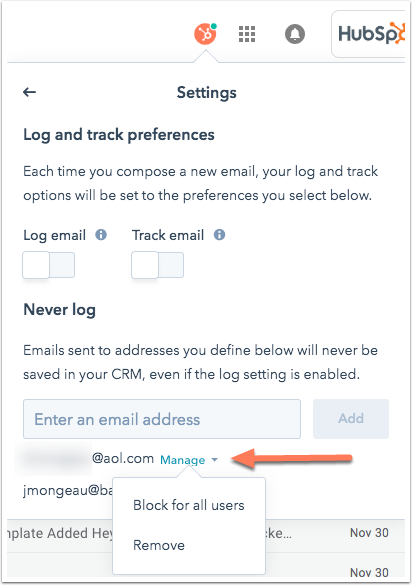 Click to toggle the Log email and Track email switches on if you want your emails to be logged and tracked by default. If you would rather manually select the boxes for logging and tracking each time you send an email, then leave these switches off. 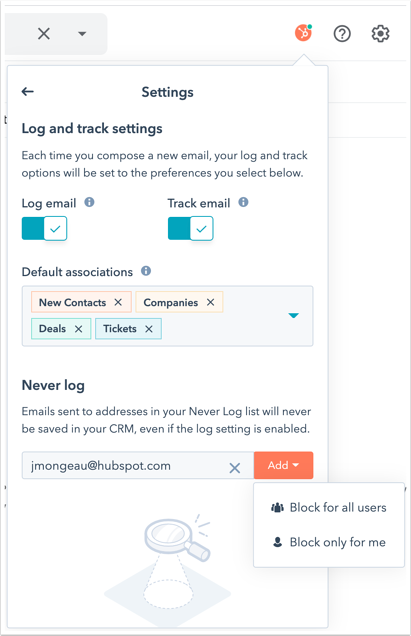 After disconnecting your inbox from HubSpot, you can disable tracking for any email addresses you have sent tracked emails to in the past. Turning off the extension for an account will fully disable the extension for the account. This will remove the ability to use sales features like sequences, templates, documents, and the Track and Log options in your inbox. To disable tracking for a particular email address, click Turn off extension. For any other inboxes you don't wish to track or log emails from, repeat the steps above. 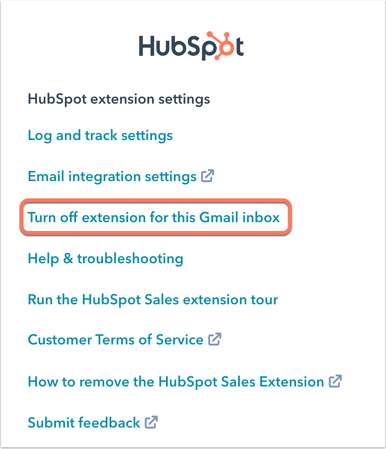 Please note: HubSpot Sales will continue to send notifications for tracked emails that were sent prior to disabling the extension. Click Email integration settings to manage the settings for your connected inbox. You'll be brought to your HubSpot account's email integration settings. If you want to learn more about how HubSpot handles your data, click Customer Terms of Service. You'll be redirected to the terms of service page. If you're looking to learn more about the extension or get stuck on something while working with it, click Help & troubleshooting to access articles in the HubSpot Knowledge Base. Click Sign out of HubSpot to sign out of your HubSpot account from Gmail. You'll be logged out and redirected to the app.hubspot.com login screen. In order to use the HubSpot Sales Chrome extension in Gmail, you must be logged in to app.hubspot.com.